ŻAK | BRANICKA has participated at the ViennaFair 2008, that took place from 24 until 27 April 2008. 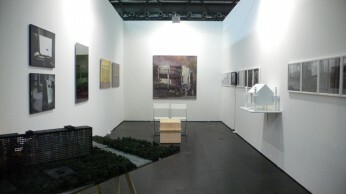 ŻAK | BRANICKA has present an exhibition of works by Hubert Czerepok, Szymon Kobylarz, Paweł Ksi?rnżek and Krzysztof Zieliński in Hall A, booth A0114. The exhibition presented at the ŻAK | BRANICKA stand focuses on one side, on how deeply we believe in the fulfillment of those promises of a future that will always remain utopic and on the other hand, on how much we doubt the probability of phenomena, that most likely are real. We had belived in a future so much, but it proved to be a catastrophy even before it was fully manifested. Everything that Modernism had promised us has remained unfulfilled, and the dream of the splendit future has turned out to be fiction. The topic of the utopia of Modernism is taken up in the work of Szymon Kobylarz in the model of a building that has been built after the L´Unite d´habitation de Marseille of Le Corbusier. This building stands today in the industrial city of Katowice (Poland), while the original no longer exists. In the work, Superjednostka the artist has sentenced the building to destruction. To the past refers also Krzysztof Zielinski, who has photographed his primary school built in the 60´s. In his works the harshness of the socialistic epoch becomes cozy. Even deeper into the past reaches Pawel Ksiazek as he refers to the exclusive aesthetic of De Stjil, and exposes its affiliations with the visual culture of the Black Metal. These works deal with the way the blending of high culture into mass culture proceeds. The project of Hubert Czerepok is a classic reenactment of events that took place in the 70´s, in a small village in Poland. Even if we believe in conspiracy theories, we don´t want to believe in the landing of an UFO, even if it could be true.